Destination America has a fun monster series that we think is a good snack for your beastly hunger. 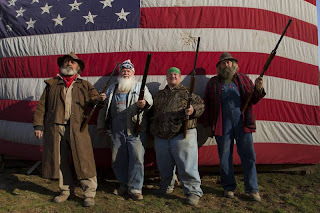 Called Mountain Monsters, it debuted Saturday, June 22, airs at 10 p.m., and follows a shaggy group of hunters and trappers -- known as The Appalachian Investigators of Mysterious Sightings (AIMS) -- as they investigate legendary and unidentified creatures in the Appalachians. 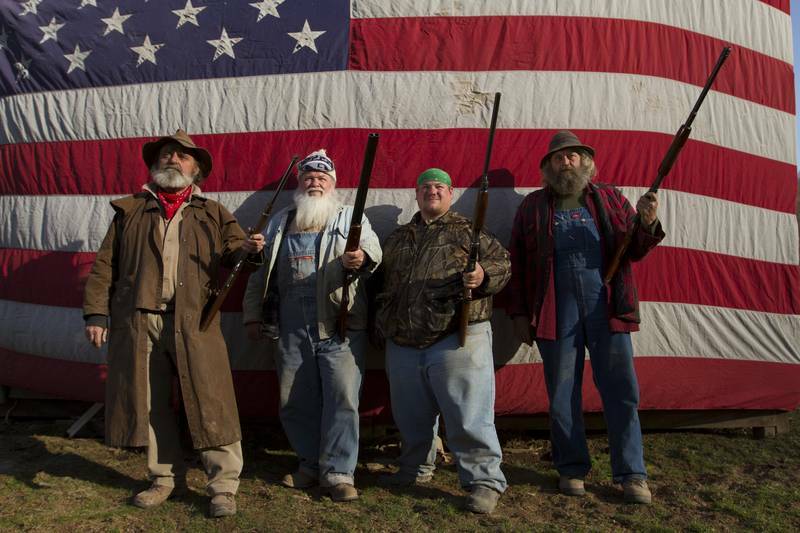 First, let’s meet this gang of native West Virginian sons of this Duck Dynasty meets Destination Truth team. The founder of AIMS is John “Trapper” Tice. He’s an older gentleman who sports a long beard like many of his cohorts. He’s a nice mix of no-nonsense and fun. He takes these woods seriously, as they all do, but will joke around when appropriate. He also doesn’t mind incorporating modern devices along with traditional trapping methods. Then we have Buck (the Rookie ... he has no beard); Huckleberry (who handles security); Wild Bill and Willy (trappers); and Jeff (he’s the researcher who needs a cool nickname and looks like Santa). The premiere episode focused on the Kentucky Wolfman. Eyewitnesses are the key in this show and the team uses the info to know where to investigate and to get an idea of what they’re dealing with in terms of size and ferocity. The Wolfman is described as a 500-lb, 7-foot-tall creature that is scaring the bejesus out of residents of Wolfe County and depleting local food sources. Do the guys catch him? Do they find a more “scientific” explanation? AIMS then took a look at Bigfoot’s cousin, the Ohio Grassman. He’s a big dude at 1000-lbs and stands 8-feet tall with grass-like fur. His footprints and nests are investigated and a huge trap is planted to catch this aggressive beast. Did they prove the Grassman’s existence? I’m not telling. You need to watch. This Saturday, July 6, the AIMS team investigates the Devil Dog of Logan County (home of the Hatfields and the McCoys.) I was lucky enough to catch a preview of this episode and I’ll go on record as saying, I recommend checking it out. First, what’s a Devil Dog? Well, according to eyewitnesses, namely a hermit named “Shoeless Terry,” (spoiler alert) there’s a pack of them and the leader is a female. These packs of large dogs, which are speculated to be a cross between wolves and coyotes, have glowing eyes and are decimating the coyote population. An impressive trap is built (because this is what they do) and the team pursues these nocturnal, big, fast, vicious creatures. Do they catch any? What are they? You really need to watch this episode this Saturday at 10 p.m. ET on Destination America. In future episodes, AIMS tackles the Wampus Beast, Mothman and Lizard Demon. These monster hunters kept me entertained for the hour-long episode. We love our monsters and our endless pursuit of them and the discovery of new and mysterious creatures every day, keeps us interested. Despite the recent discovery that the Loch Ness Monster may just be a result of a fault line, we curious humans will still hold on to the hope that real monsters are out there. Why though? They’re scary and can kill us! I think it’s because as humans, we’re always searching for the unexplained, and the idea that monsters exist, allows us to hang on to at least a little part of our childhood. Plus, they’re just plain cool.